First of all, the Darko looks the business - sporting some sick graphics both top and bottom, which is sure to stand out at your local kite spot. 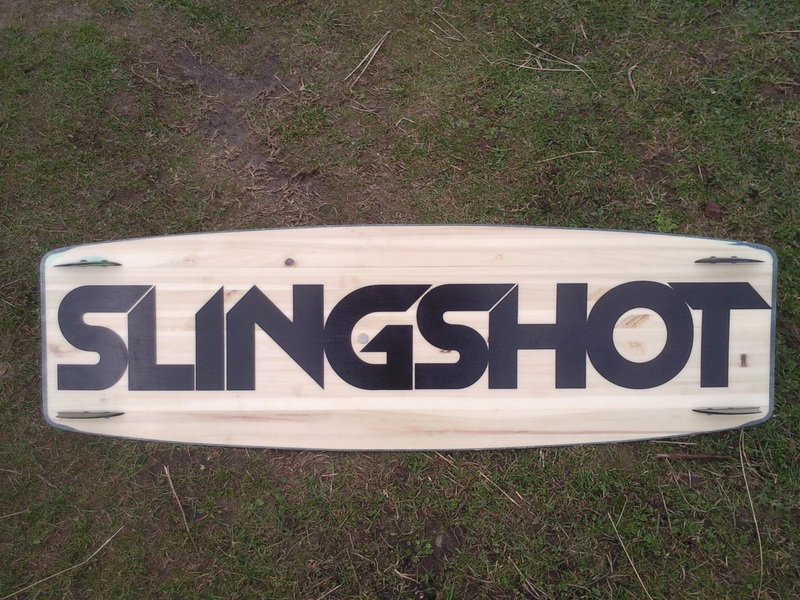 The underside shows off the wood core very nicely and has the slingshot logo boldly printed along the length. 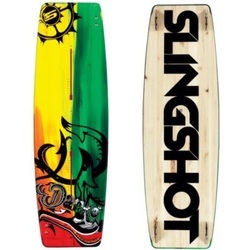 The deck is light and feels quite flexible, but the heavy duty slingshot fittings add to the weight somewhat. The Darko comes with the fast track mounting system which allows the pad spacing to be set to your exact preference. The Darko has a 3 stage rocker, extending to 35mm at the tips. It also has a central single concave, spray release edges and 50cm fins. When you ride the Darko, the first thing you notice is the stiffness - as an aggressive freestyle board this comes as no great surprise, yet the flex of the tips smooth out the rough quite nicely, and its generally a comfortable ride. Provided you're well powered, the very next thing you'll notice will be the speed, and boy does this thing shift when it gets the chance! It provides a really exhilarating 'seat of your pants' ride, flying through the flats or chop with ease, helped by the large fins which give it a great directional stability. Its low drag also helps its low end efficiency, and the wide tips give it a large planing area to help getting going in the first place. The Darko is also an excellent upwind performer, which helps you spend most of your time doing what you enjoy, rather than battling to maintain your ground. Despite the wide tips, the Darko is quite capable through a carve, and caused no real issues when turning on the face of a wave. The tips do kick up some spray when battling out through the chop when underpowered, but it glides over it effortlessly when travelling at speed. 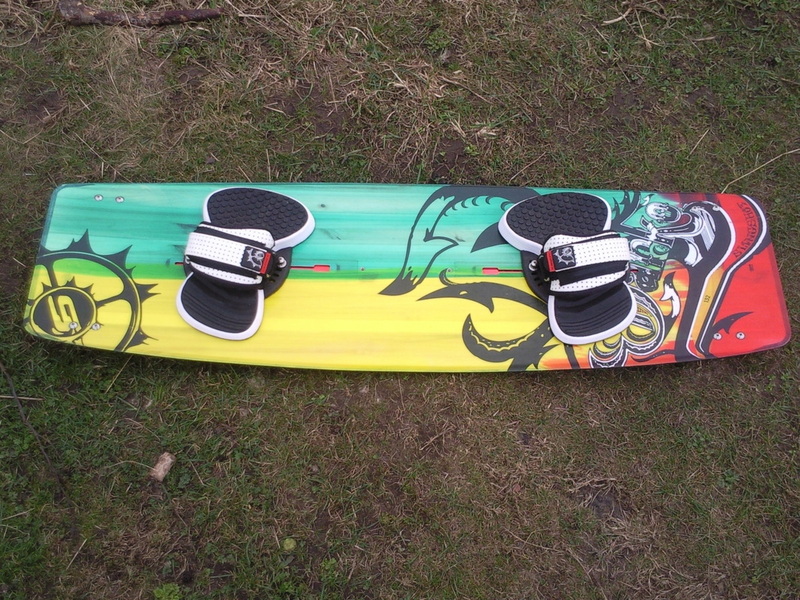 The pads, straps and fast track system give a comfortable, solid connection with the board, giving you plenty of confidence to really push it. The pads felt hard initially, but just required a little bedding in, and soon softened up a bit underfoot. 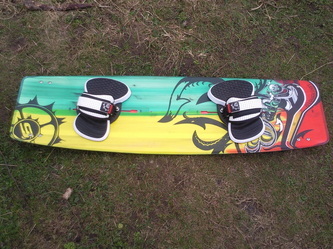 As the Darko is primarily a freestyle machine, you'd expect it to be great for popping boosting, and landing. It came as no surprise that it was excellent in all these departments. The fins, edge and outline grip the water extremely well and allow you to really edge hard against the kite without 'slipping out'. This leads to big airs, huge unhooked pop and helps promote maximum slacking of the kite for air-passes and easy landings. The tip flex, fin size and spacing give great control and good cushioned landings. 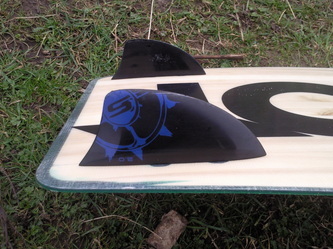 The fins can take a little bit of getting used to when spinning the board around after a pass, but provided the board is flattened off well, it will spin without any issues. The Darko is a great choice for anyone into freestyle in a big way, with its explosive pop off flat and kickers, excellent upwind performance and great top end speed. 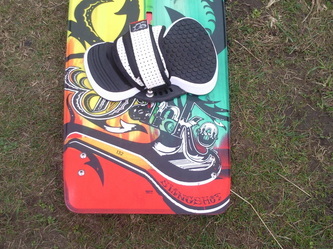 Its an easy board to ride, which is at its best in good conditions and is sure to get the heart pumping when you're powered - this board is equivalent to the Legendary Fuel - Rad, Mad, Bad!. 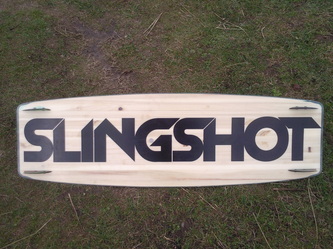 2012 Darko from Slingshot Kite on Vimeo.